I fought my way through an hour of traffic to get to the cafe and all I found was an empty couch where my knitting buddies should have been sitting. I was worried the wet, cold weather had scared everyone off. 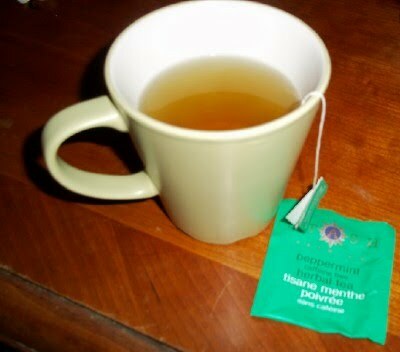 It was a hot tea kind of night. 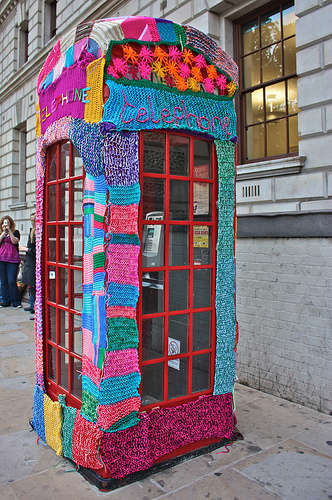 One by one, a few brave knitters finally appeared. It was a much smaller group than usual. Show and Tell began with last week's birthday girl. She had more presents to share. 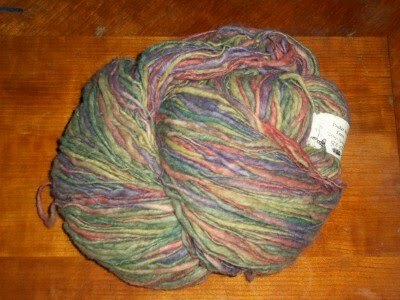 This giant ball of handspun from Pucker Brush farms got a lot of ooohs and aaahs. They are one of my favorite booths at the Maryland Sheep and Wool Festival-which is just a month or so away now. I can't wait. 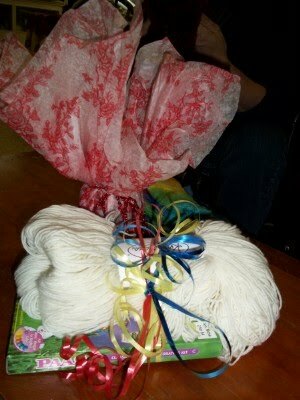 My gift to her last week had been a skein of Knit Picks Bare sock yarn and a box of Paas egg dye. On Thursday I got a call asking for directions. Here are the results of her first dye job. Not bad considering she didn't add any water to the vinegar. That's what I get for assuming everyone knows how to dye an egg. No matter, it turned out fine. I can't wait to see what she turns it into. 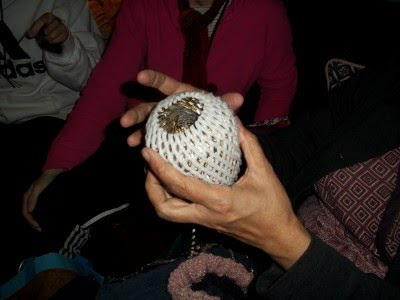 We were also given a demonstration on how to reuse an Asian pear wrapper as a yarn bra. Apparently these things litter the produce section of Asian markets. She brought plenty for us to share. 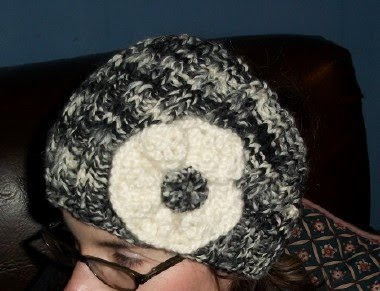 She was also working on a mixed fiber hat. 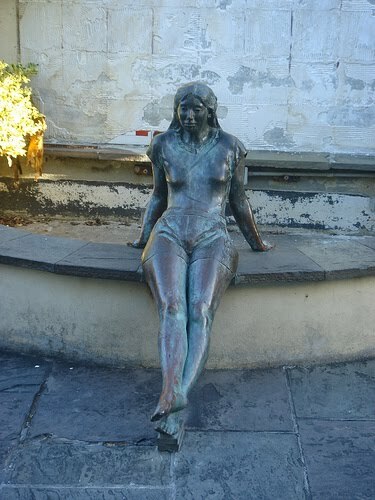 Over the weekend she had been to The Torpedo Factory which houses 3 floors of open art studios. 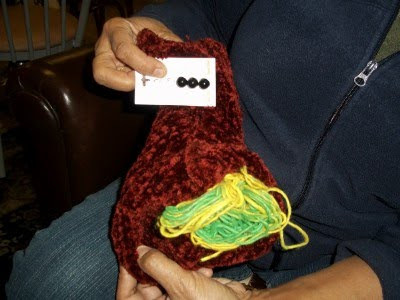 She was so inspired by the fiber artists that she filled a bag with assorted yarns and is combining them into a one of a kind fiber statement. I'm impressed. Miss Prodigy had made an adorable flower enhanced Calorimetry since we last saw her. 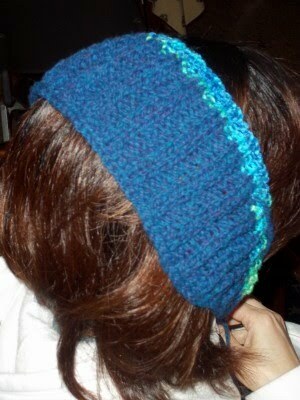 She also made a ribbed headband that looked very nice on her cute little self. 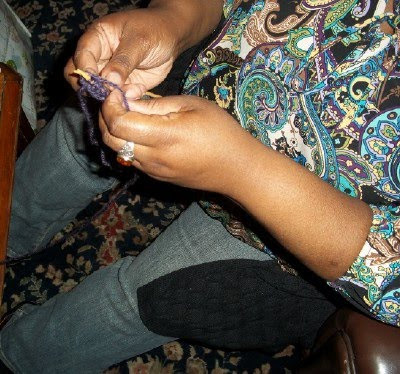 After modeling for us, she spent the night giving her new Turkish spindle a workout. 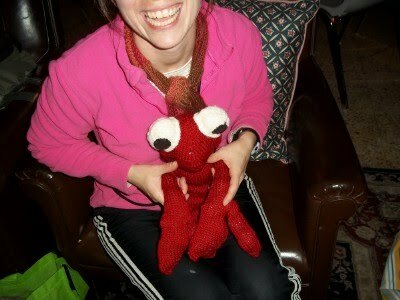 The lobster aka Jacques Crusteau got his pupils and his smile sewn on. Right before our eyes, he came to life. 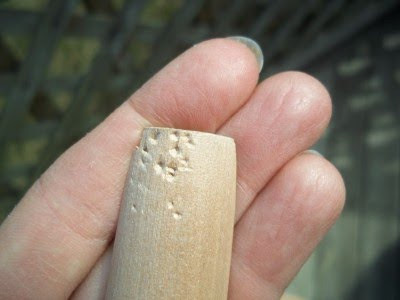 I discovered teeth marks in my niddy noddy. I am NOT happy. 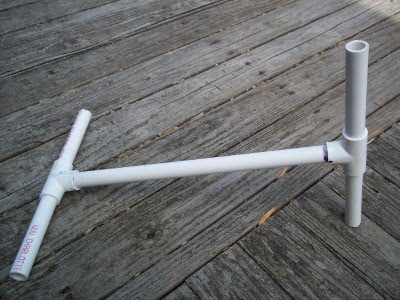 This ought to fix their little kitty wagons. Let them take a bite out of this one. 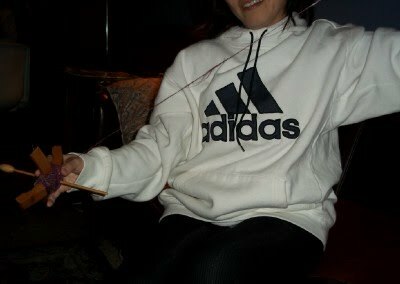 This is the third front band I have picked up and knit on my Classic Lines Cardigan. The first one was a nightmare. The second one seemed to be a bit easier and then when I compared the two, the first one looked awful. 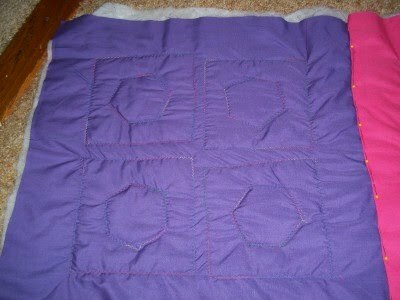 I had to rip it out and the worst part was that I had already tacked it down and woven in the loose ends. Ripping was not easy. The second time around, I managed to follow the line of stitches much better-leaving a nice straight ditch between the edges (although you can't really tell from this photo). 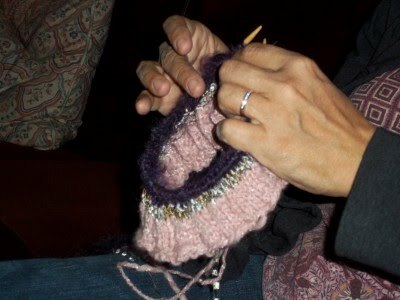 The sweater would be a Finished Object tonight if I had not strongly felt the urge to leave it be for a time. I always trust my "it's time to walk away" instinct. Always. I'll tack it all down tomorrow and try not to look too hard for any other boo boos. It's been almost a year and this sweater's time is up. It's time to move on. 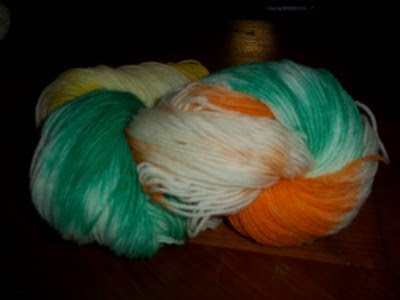 I spun the yarn for my next project-to-be ages ago and I have been very proud of the fact that I have not yet cast it on. 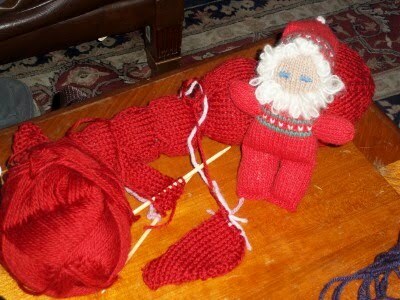 It is sitting in plain sight waiting for me to finish up the other projects before it goes on the needles. The problem is that things keep butting in line. I'm giving it two more weeks and if things haven't cleared up, I am going ahead and starting it anyway. 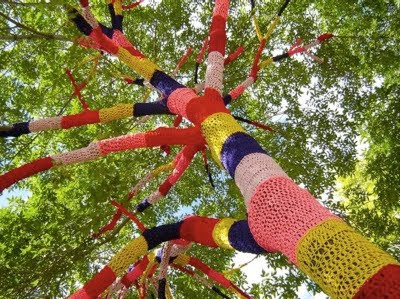 It's waited long enough and so have I.
Yarn bombing, graffiti knitting or yarnstorming is a type of street art that employs colorful displays of knitted or crocheted cloth rather than paint or chalk. While yarn installations – called yarn bombs or yarnstorms – may last for years, they are considered non-permanent, and, unlike graffiti, can be easily removed if necessary. The practice is believed to have originated in the U.S. with Texas knitters trying to find a creative way to use their leftover and unfinished knitting projects, but it has since spread worldwide. That is how Wikipedia explains all the colorful goings on you see here-all NOT of my doing-not yet anyway. Number 2 son has challenged me to undertake this mission but here in our bland little hometown I am not finding anything interesting on which to do the deed. I am still looking. It's too bad my little French Market friend doesn't live around here. I do know where these guys live but that would be just too easy. That wildly twisted Shetland single I spun two weeks ago has now "cured" to the point where it feels like something I could knit with. 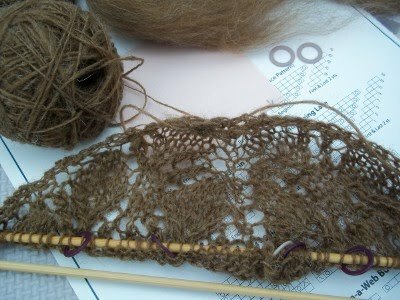 I only meant to knit a lace sample for my Ravelry group but it was working so nicely, it now looks like I have shawl number 3 on the needles. 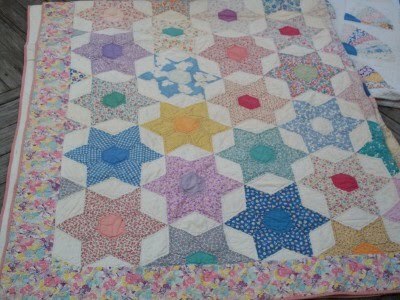 It is another Evelyn Clark pattern. 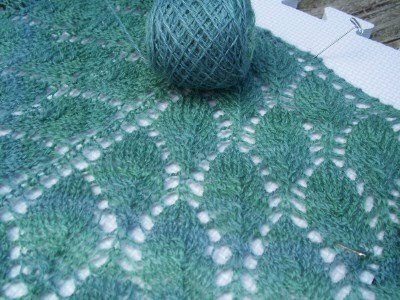 This time it's her Spinner's Lace Shawl. 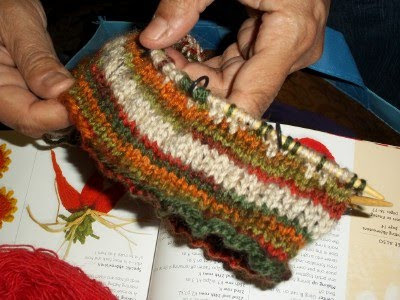 It is going to be wonky and very rustic but those are the kind that I wear around the house all the time. I have a very bad habit of packing away all the nice ones for some unspecified occasion that I can't even imagine. In other words, I knit them for fun. Wearing is optional. Someone got homemade fig chutney and a dye your own sock kit. It was Lobster Girl's birthday and she had slaved over this claw so she would have some progress to share on her special night. It's hard to tell from this photo but it is a very big lobster. I should also say that she is a full time teacher and mommy to an almost 2 year old. 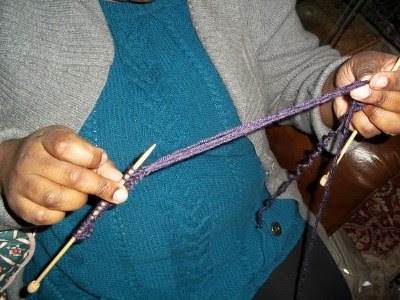 How she finds the time to knit anything is beyond me. The rest of this week's Show and Tell had an interesting "foot" theme. First we had a newly finished slipper that was declared so unwearable by its creator that we debated on how to turn it into a monster of sorts. 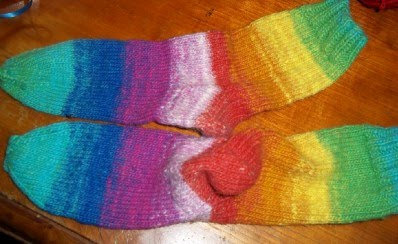 She also brought along the newly completed rainbow socks that I love, love, love. I am a fanatic when it comes to matching up colors and these are P.E.R.F.E.C.T. 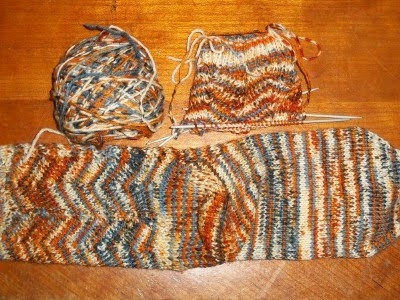 I was able to show off one finished Jaywalker and a good start on the second. 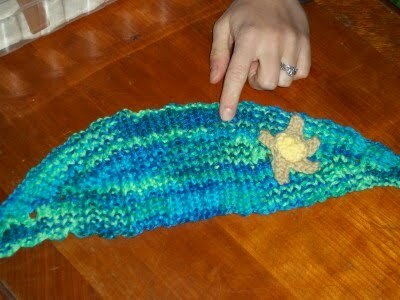 These toe-ups have a secret hidden inside. 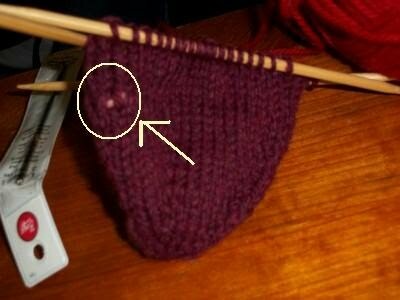 Somehow a stitch marker got knit inside the stitches. Of course I didn't get a photo of the inside but you can see it peeking through the front. 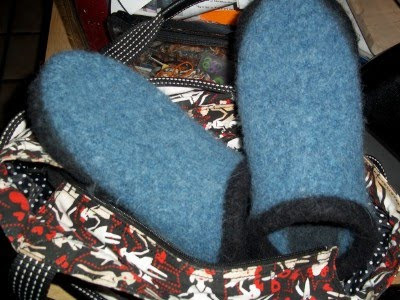 I brought the newly felted clogs to show and they got some attention from an unlikely source. 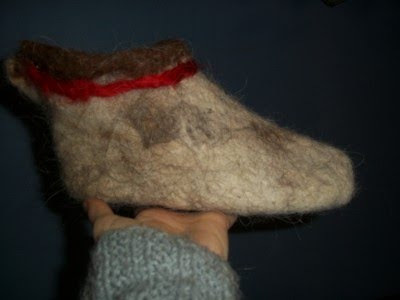 A diner in the cafe knew a thing or two about felting and went out to their car to get a pair of felted slippers that were made from llama. 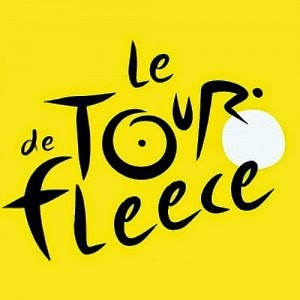 They were not knitted but formed out of sheets of felted fiber. Now you just know I am going to have to give that a try. I am happy to say that the Fake Isle hat that was frogged for being too small a few weeks ago is now a few inches into the second try. 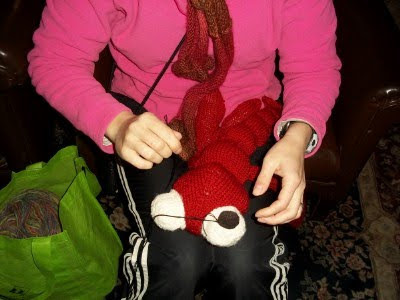 Poor newbie knitter was sick but put on a brave face to give it her best. Oooops. It all went to hell. The lesson here is to just pull it all off and start again. Stuff happens and we have all been there. 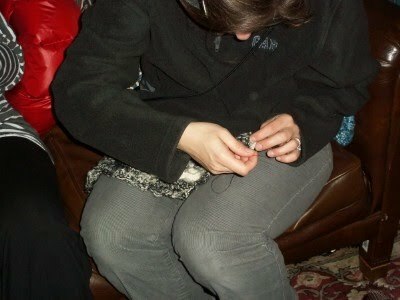 The birthday girl spent the evening trying to figure out how to join a small circle of stitches which is no easy task. 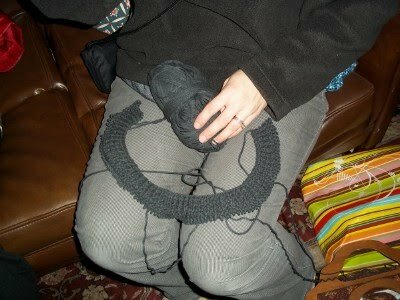 It took me three entire days to cast on the tiny center for my Pi Shawl so I know how tough that can be. We ended the evening debating the size of a lobster eye. Seriously. 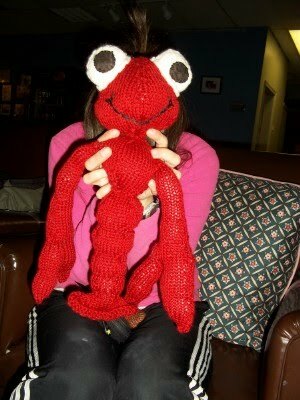 That lobster has some big eyes. 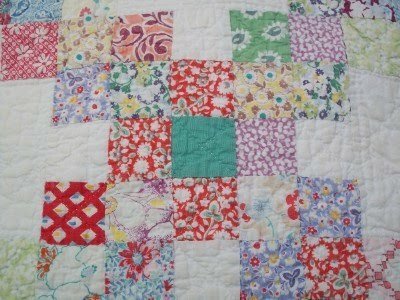 My great grandmother was a quilter. In spite of suffering from severe arthritis in her hands she managed to leave behind a pile of masterpieces. 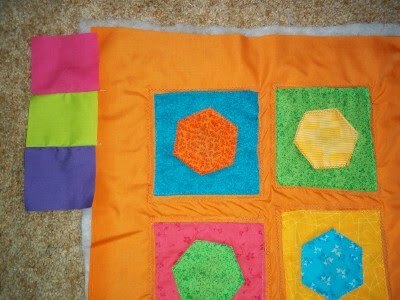 She did not have a sewing machine. Everything was done by hand. 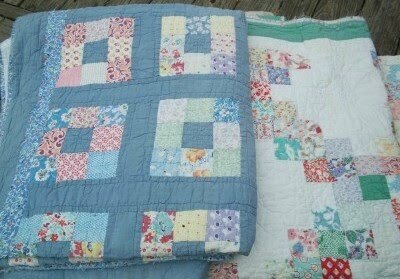 These quilts are HUGE. 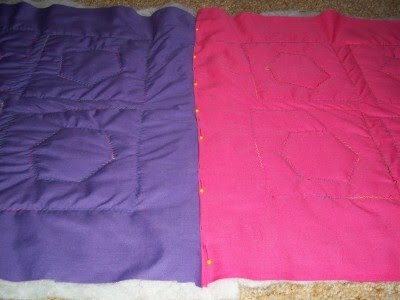 Double bed size or larger. These were meant to be used and by their condition, they certainly were. They are also HEAVY. I worked up a sweat on a cold day dragging them outside for photos. There are more than I am showing here but I gave up taking their photos because they wore me out. 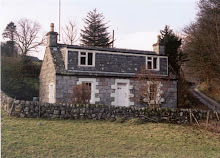 Funny thing is, that when they were closing up the family house, they were to be thrown away. Seriously. I rescued them and have given them a home for more than 30 years now. I know I am taking a risk showing them off here because now that the remaining family knows they exist, I am pretty sure everyone will want one. Get in line. There's enough to go around. I don't get many boxes anymore so when one arrives it is a very big deal. 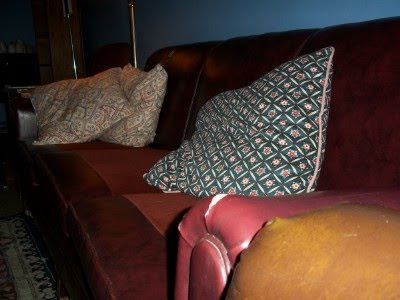 Look at all that great 1930s inspired material. 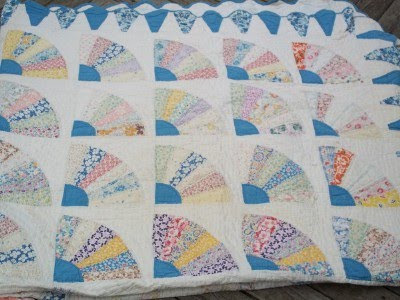 It's the Canning Day collection from Connecting Threads. 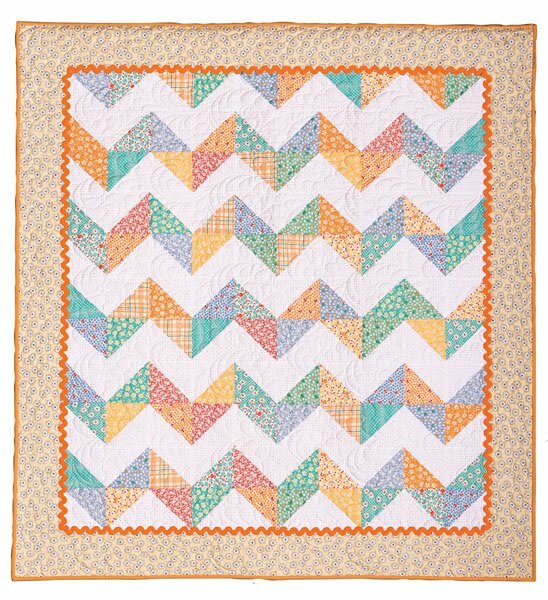 If I ever get my sewing machine back from Daddio, I am going to start making the 55 half square triangles needed to put together my summery little lap quilt. 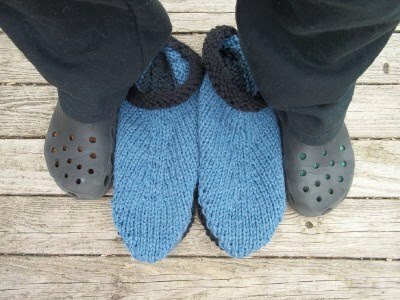 My third pair of felted clogs were promised to my sister ages ago. I haven't forgotten them, I just seem to always run out of time these days. 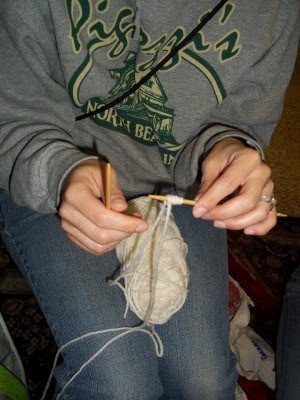 I get up and start in one place and end up in another and never seem to get to sit down and knit anymore. Now I just need to find an hour of time to get them felted. 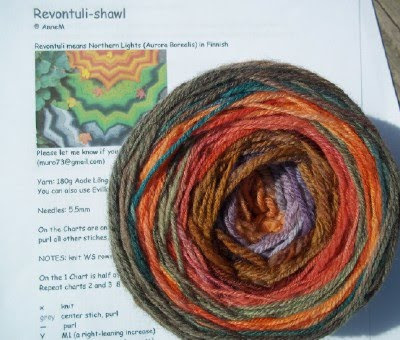 My Sheep and Wool project is finally starting to look like a shawl. 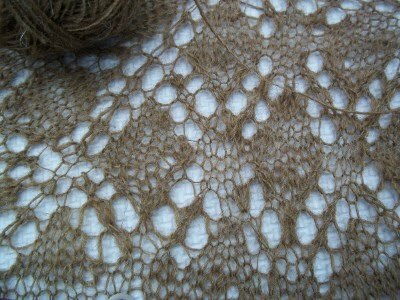 From here I am going to transition into another lace pattern for about 20 more rows and then start the edging. Judging from that little ball of yarn I have left I also better start spindling more green Polwarth. I am pretty sure I am going to run out. I always do. 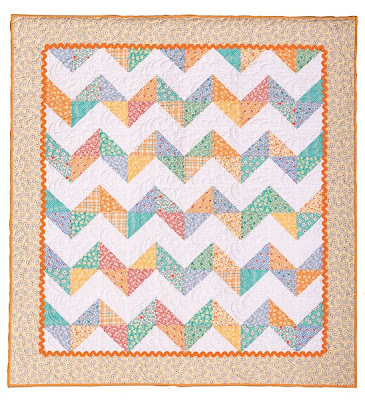 Try as I might, I could no longer resist the impulse to buy this quilt kit. 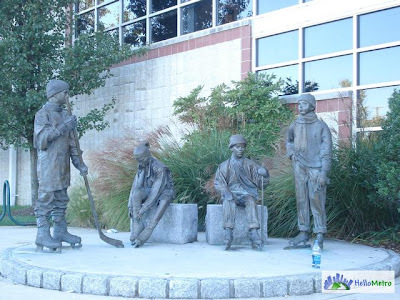 This is NOT mine but the photo from the website. 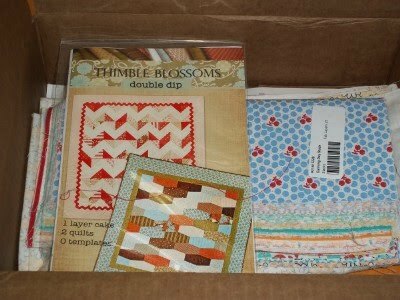 It is $28 over at Connecting Threads. I love the washed out colors and the giant rick rack. It looks like something you would find artfully draped over a white washed chair in a beach house in the summer. I want one. Now I just hope I have what it takes to put it all together. 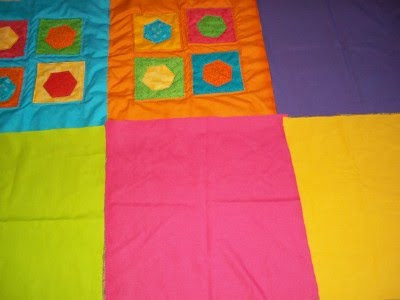 Daddio's next quilting adventure is starting to come together in a big way. 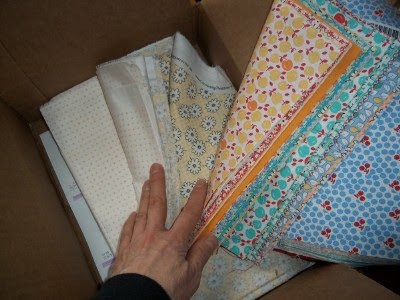 Big seams that need to be whip stitched by hand. Big quilt-as-you-go machine stitched patterns on the back. 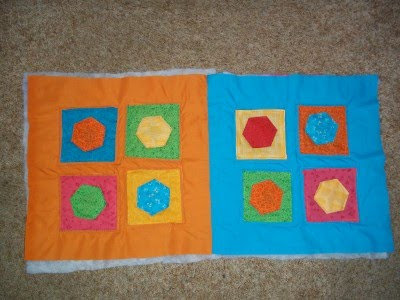 And finally a big pieced border to tie it all together. The recipient of this beauty is in for a BIG surprise-who ever that may be. I really don't know. He's not saying and I'm not asking. 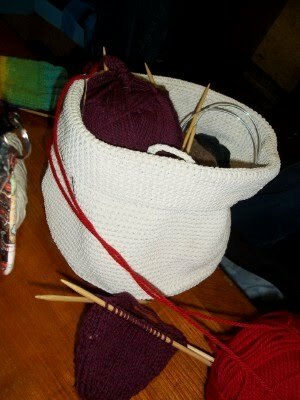 I did very little knitting tonight. 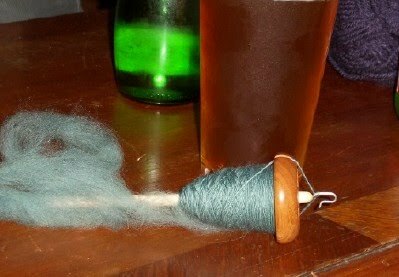 Instead I played drop the spindle. I don't mean drop spindling. I mean drop-the-spindle. It just kept hitting the floor, poor thing. I had to put it away. The reason is right here. India Pale Ale. It was good. I had a few sips and that was it for me. The brain and hand had a complete disconnect for the rest of the evening. I am pretty sure the mouth however, was working overtime. I also took lots of bad pictures. We were being entertained by an amazing troop of belly dancers and this was the best I could do. Shameful. 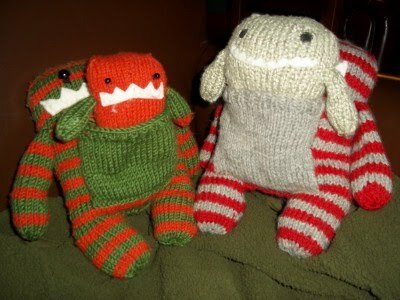 The little monster family was a little easier to deal with than the belly dancers since they were sitting very still. They are ridiculously cute. I want them. Lots of them. 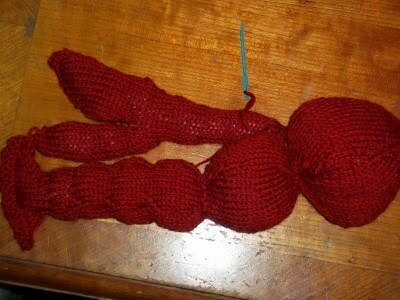 I brought my Gnomey to play with the lobster who is not quite all there yet. Gnomey didn't mind. It was the first time he had ever left the house-and there was beer AND dancing girls. 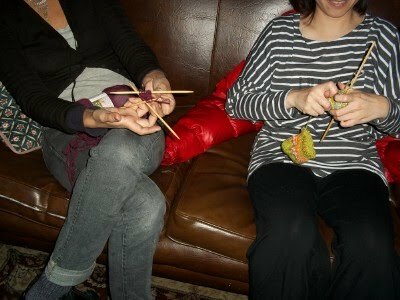 In spite of the amount of booze being consumed, some people did get some knitting done. 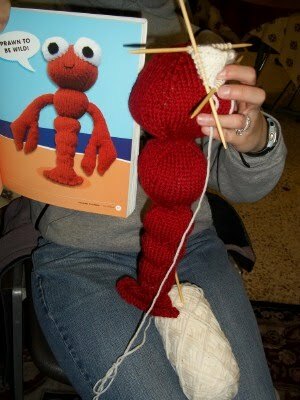 There was also a lot of "unknitting" being done tonight. Miss Prodigy was using her new Turkish spindles to frog her ginormous knee socks. She quickly went from socks to center pull balls. Brilliant. The pants went off to the frog pond also. I am not sure why but I suppose it was for a good reason. 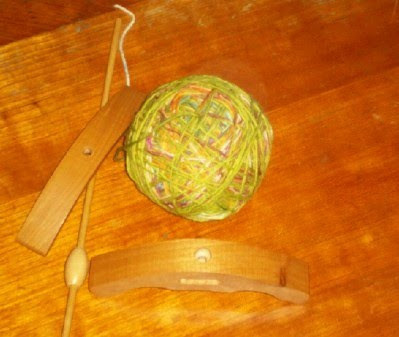 A needle and thread was produced for some stitching. A button was added to the Calorimetry to make it a done deal. I love it. I need to make flowers now for mine. When I find them. I packed them away last spring and I haven't seen them since. 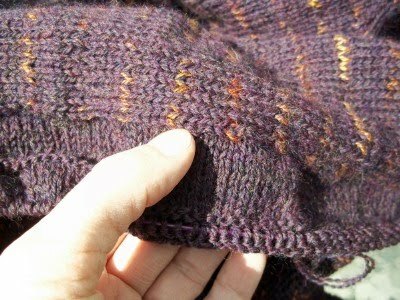 Newbie Knitter managed to knit another row which was her very first "all my herself" transfer over to another needle and then somehow knit back in the wrong direction. 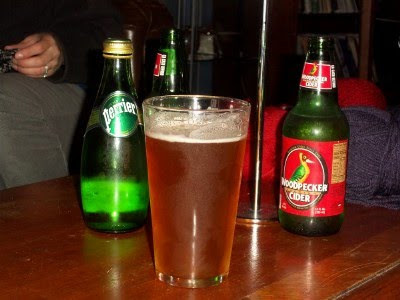 I am going to blame it on the hard cider she was sipping but actually it is something knitters do all the time-even sober ones.